Periodization: Which Method Is Best? Periodization, simply stated, is the organization of training into blocks or units of time that focus on specific skills. Read more! Periodization, simply stated, is the organization of training into blocks or units of time that focus on specific skills. The concept has only recently made inroads in Western training, though it is a very old one in the programs of the Soviets and Eastern bloc nations. 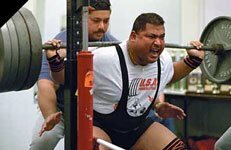 The most commonly known form of periodization in the United States is the linear style, in which training is broken into hypertrophy, strength, power, and transition phases. This is the style originally developed by the Soviet researcher Matveyev, and this method has often been misunderstood by Western strength coaches. This is what has resulted in the large wash of complaints about the efficiency of periodization in general--most people feel that this is the only method of organizing one&apos;s training, when in fact that couldn&apos;t be further from the truth. An ideal training program is one that allows for personal differences and increases in the desired capabilities. Because the body is a dynamic thing, constantly changing, no one method or methods can be continuously effective at all times. The basis of periodization is the changing (cycling) of training variables, including load, volume, relative intensity, perceived intensity, and a host of others, to achieve the desired effect. To cycle these variables in a synergistic fashion, that is, to have each block enhance the following block, is the goal of periodization. This is a very broad definition, however, and not what is traditionally thought of when one uses the term "periodization." The units of periodization are as follows: the microcycle, the mesocycle, the macrocycle, and the Quadrennial (the 4 year Olympic plan). The microcycle is usually a single workout, but can be stretched to a longer period, say a week. The mesocycle is a series of microcycles oriented towards a specific goal. The macrocycle is a series of mesocycles linked to provide the final goal. The Quadrennial is rarely used outside the training of Olympic athletes, but is geared around four year-long macrocycles. Linear periodization is the "classic" method originally created by Matveyev. Consisting of a Hypertrophy phase, a Strength phase, a Power phase, and a Restorative phase, linear periodization is what is usually brought to mind. Each "mesocycle" is directed towards a single goal. Hypertrophy, for example, uses several sets of 8-12 reps, designed to stimulate growth. Strength builds on this hypertrophy, and changes the reps to 5-8. Power finalizes this, using 1-5 reps. The Restorative phase drops volume, or eliminates training entirely. This can be an effective means to train for some athletes, especially beginners. However, for a more advanced athlete, or those concerned with other goals, it is far from optimal. The main reason being that the qualities developed in the preceding phases aren&apos;t carried over. By the time you reach the Power phase, you&apos;ve lost or are losing all the hypertrophy you developed. What Is Your Experience Level As A Bodybuilder? Fortunately, the linear approach isn&apos;t the only method available for those who wish to schedule their training. Originally introduced by Dr. Verkhoshansky, the so-called "conjugate method" of periodization makes many improvements on the linear style. Verkhoshansky calls for the "linking" of two (or more) qualities that need to be developed, and training them in the context of a greater program. The most popular example of this method is that used by Westside Barbell. Combining the qualities of speed-strength and limit strength in a week-long microcycle, Westside has effectively created a method that enhances both, and uses the increases in one to augment the other. However, it isn&apos;t hard to imagine other ways to utilize this method. Training anaerobic-endurance and maximal strength, for example, would be a good way to stimulate hypertrophy. Even the conjugate method has its drawbacks, though. For one, there are only so many days in the week, and the body can only handle so many stressors. You can&apos;t conceivably train everything that needs to be trained in a given microcycle. Inevitably, some things are going to suffer for it. For a powerlifter, a bodybuilder, or a few other types of specialized athletes, this might be fine. But what about the athletes that need a more well-rounded approach? Football, basketball, baseball, wrestling, volleyball, track, swimming, and all types of martial arts are a few that fall into this category. Anyone interested in a general base of fitness, size, and strength would, as well. These athletes would require hypertrophy, speed-strength, strength endurance, maximal strength, and aerobic endurance, to varying degrees. All of these require different forms of training, and some are counter to the others. The way to manage this is to use the conjugate method along with a linear method. That doesn&apos;t mean Matveyev&apos;s linear approach, but rather to use a linear series of blocks that focus on several abilities at once. Fred Hatfield uses an approach like this, as does Olympic Weightlifting coach JV Askem, along with many other strength and Olympic coaches. Bodybuilders or any other athlete concerned with just mass do not need to be as concerned with the long-term planning of training. However, periodizing their training into shorter blocks can be effective as well. Although there are many different types of periodization, I am going to outline the three most prevalent types, Western style, Conjugated, Undulating, and one that I have developed which I call the Hybrid method. Research has shown that the detrimental effects of "overreaching" in training do not begin until the fourth to sixth week of training in that fashion. The proposal is simple: increase your total loading volume for three or four weeks, then take a single week of lowered volume to "deload." These blocks of training should be interspersed with occasional blocks devoted to other qualities, as well-anaerobic endurance, limit strength, and restoration are all possibilities, as they have direct carryover to the traditional mass training. The standard mass training block should revolve around a core of compound exercises, with additional compound and isolation movements added to it. Shoot for 3-4 sets in the 6-10 rep range, close to failure, with short rests. For smaller bodyparts that have quicker recovery, a second day can be added with a single exercise for a few sets, taken to failure if you wish. The deloading week should involve removal of all but the original compound movements, for 2-3 sets. Any second day you have for a bodypart should be removed as well. Failure on sets is your choice. The other types of blocks should be done according to your preference. The max strength cycle should focus on a compound exercise done for sets in the 2-5 rep range, followed by accessory exercises and component exercises. Deload by removing the accessory exercises and cutting volume on the component exercises. Anaerobic endurance should involve one or two compound movements for 5-8 sets of 6-8, absolutely not to failure, with 45-60 second rests between sets. Also include a few exercises of "standard" mass work. Cardio oriented around interval training could be included as well. Deload by removing one of the main exercises, and again lowering the volume on the mass-oriented exercises. The restoration cycle is basically a period of lowered volume and stress-imagine the deloading week for all four weeks. This should be based around a HIT-style program, emphasizing only compound movements for a few sets, to failure. The important thing to stress is that all of these qualities should be stressed during all blocks, just to different degrees. For example, even during mass blocks, you can train a key compound exercise for strength, just as you can do the same during an anaerobic-endurance block. Finally, you can string these blocks together in any way that is needed-use a strength block, then two mass blocks, followed by an AE block, then a restoration block. Or any other combination you like. This method employs a means of making sure that gains aren&apos;t compromised by overtraining, ensuring that all qualities of training are incorporated, and that a very efficient way of using the body&apos;s resources is utilized. Linear periodization may not be the best method out there, nor is the conjugate method. But when it really comes down to it, there is no "best" way. Even the method I just outlined has its flaws. The trick is to keep all these tools available to you, and to use them when required. For the bodybuilder, a form of conjugate periodization or unidirectional loading (simple progression with no planning) would be fine most of the time. But that&apos;s not to say that a change couldn&apos;t be effective. Same goes for a powerlifter in the off-season. Those interested in general athletic performance should use an approach that maximizes other qualities, however. My personal opinion is that all athletes, bodybuilders included, should develop this foundation of athletic capability. This is why I outlined the preceding program-by using short, focused blocks, athletes not concerned with long-term planning can still make gains in all required areas. Additionally, the mass-oriented block takes advantage of short-term overtraining; what has long been considered an enemy of the strength trainee is actually being used to foster gains. All being said, periodization should be used when periodization is needed. Just as with any type of training protocol. If you have a question in regards to this article or have any other bodybuilding questions then please register for free and ask at our bodybuilding forums http://www.wannabebigforums.com.